Ceramic tile flooring is durable, practical, and beautiful. Ceramic tile in the kitchen is smart because it can withstand not only the heavy traffic of a kitchen, but also the grease and food spills so common in kitchens. Ceramic tile has been used for thousands of years in various applications, ceramic flooring being among the uses. Kitchen ceramic flooring is easy to clean and easy to create interesting and beautiful designs with. Ceramic tiles in your kitchen may be just the solution you seek for beauty and durability. Are you looking for the type of kitchen flooring that is durable, and best of all, easy to clean, and to take care of? Installing ceramic tile in the kitchen is one option to meet those needs and it is beautiful too. Ceramic tile has been used for thousands of years in all kinds of different applications. You can even find intact ceramic tile mosaics that survived the eruption of Mount Vesuvius in Pompeii; that dates them to around 79 A.D. This just reinforces the idea that ceramic tile is durable and can withstand years of wear and tear, and abuse. In the kitchen, ceramic flooring is ideal. In most homes, the kitchen is the central hub of activity. Cooking is just one of the many activities that happen in the kitchen. You have it turned into a guest room when some lady friends are visiting. They like to sit and chat in the kitchen. If they have kids with them, the kitchen will suddenly become a playground for them. And you know how kids are. They fall and throw and scratch and drop. So what you will need is a durable kitchen floor that is always aesthetically pleasing to the eyes. This is why you should go with ceramic tile flooring in the kitchen. Why is ceramic tile so durable? Kitchen ceramic flooring is composed of tiles that have been formed from clay and fired at a very high heat until they because strong and hard. The glaze is then baked on which only adds to the strength and hardness of the tiles. Ceramic tiles come in many different sizes, shapes, and colors. This makes it very easy to create custom designs and patterns with the tiles. Using your creativity with the many colors, shapes, and sizes of ceramic tile will help you to create a custom floor that your friends and family will be envious of. Using several different sizes of ceramic tiles will help to create texture and interest to your floors, which makes them more appealing to the eye. They are very economical and available in abundance. 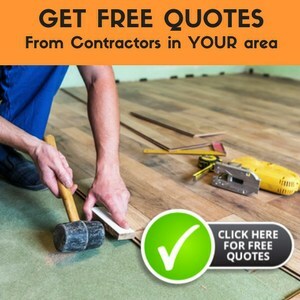 This being the case, you don’t have to worry about the costs involved and it also gives you the unique opportunity to experiment with it a bit, which is not possible with costly hardwood flooring. Ceramic tiles are also water resistant, which means that spills that happen in the kitchen won’t stain the tiles. The added benefits of being scratch resistant and fire resistant make the tiles great for kitchen use. Being easy to clean and to take care of is a bonus, especially in kitchen flooring. Ceramic tiles need minimal attention. With regular dust mopping and sponge mopping, they will stay beautiful for years and years. Also, it is safe if you have kids at home because the water is easily visible and hence can be mopped up timely. When choosing ceramic tiles for your kitchen, keep in mind that they will most likely last for your entire lifetime so you need to pick tiles that can go with many different design styles. Ceramic tile may be an investment, but with their durability, it is well worth your initial investment to install them or have them installed by a professional. Research your ceramic tile choices to make sure that you spend your money wisely to create the custom kitchen flooring of your dreams. It is always best to go with the contemporary styles because you never know how long an old pattern is going to stay in vogue. Ceramic tile is a practical choice for your kitchen. It’s a choice that will last for the lifetime of your home and will continue looking beautiful with very little care. If you are looking for a beautiful, durable floor that will last through years, then you want to choose ceramic tile flooring for your kitchen. Is there a difference between porcelain and ceramic tile or are they the same? Does either need to be sealed for a kitchen floor. If not the tile, does the grout need to be sealed. Porcelain tiles are formed under extremely high pressure and fired at very high temperatures. This make these tiles much denser and stronger than glazed ceramic tiles. Ceramic tile is a great option, and yes, if nothing else, the grout should be sealed, though it’s best to seal the entire floor, because ceramic tile can get stained. Can you tell me what is the best thing to use to clean the ceramic kitchen floor; Swifter, old fashioned rope mop, spone mop, or steam cleaner? I have great sucess damp-mopping with a vinegar/water solution (1:15 ratio) with a microfiber mop. Have a spare mop head (dry)or a microfiber cloth to “polish” your tile afterwards – no streaks or smudges that way! I’m wondering what your recomendation for flooring would be. Glazed,rustic,ceramic ,porcelin ? Larry, there’s many choices for suitable flooring for your situation. It’s probably going to help you more to literally go shopping to see what you actually like first. I want to put tile in my kitchen (250 sq feet). I’m unsure about the color of tile I should pick. Do I need to match the cabinets to the floor? The cabinets are oak now but I have considered painting them white at a later date. I want to have a tile that would match either. Decorating is a personal choice that is very hard to help with. I would suggest picking up some samples at a local home center, and finding what looks best to you.